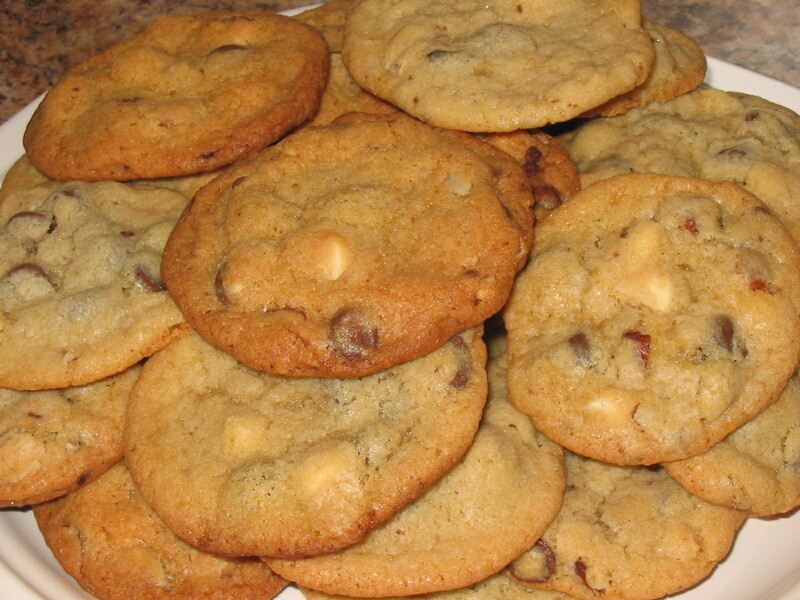 Happy National Chocolate Chip Day! Wait, you didn’t know it was Chocolate Chip Day? To be honest, neither did I, and I probably never would have known had I not been desperately scouring the Internet for a cookie recipe that would use up all the odds and ends I have in my pantry. And so it was fitting that I ended up with the Jumbo 3-Chip Cookies on Nestlé’s website. I halved the recipe as I didn’t have enough of the various chips or nuts to make a full batch and also opted to make smaller cookies to make the half batch go farther. The cookies are of the classic Toll House cookie model — very thin, almost crisp, buttery — except with three different kinds of chocolate chips (semi-sweet, milk and white chocolate). I have to confess that I think the charm is mostly in the name and the appearance of the cookies since I found it difficult to distinguish tastewise between the semi-sweet and milk chocolate chips, and the white chocolate flavor was completely overwhelmed by the other darker chips. One positive note: since I usually don’t add nuts to my chocolate chip cookies, I was pleasantly surprised by how nicely the hazelnuts I used complemented the other flavors. I’m not sure I would go out of my way to make these again, but they were just what I was looking for this afternoon. Now this is a proper whole grain muffin! 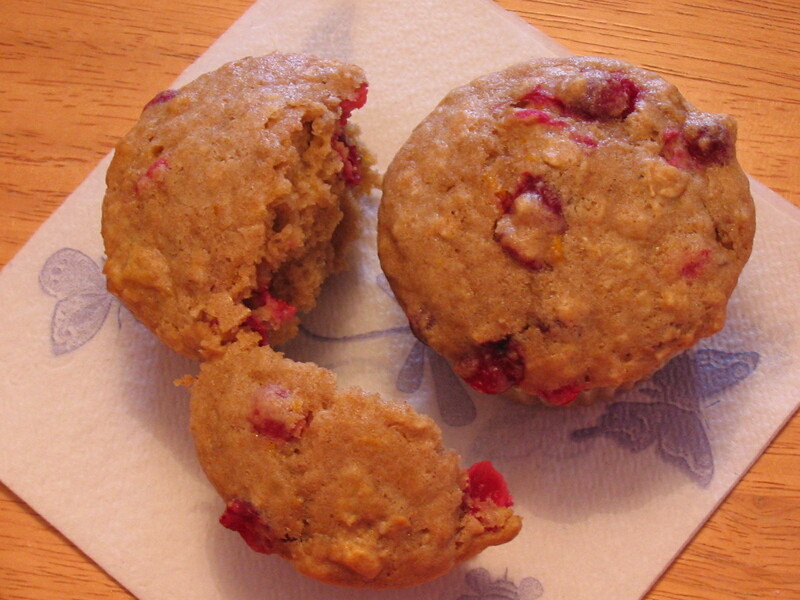 It’s made with whole wheat flour and oats, and also has fresh cranberries, orange zest and chopped walnuts. The original recipe actually calls for an orange glaze, but I omitted it because I didn’t feel it needed more sugar. Without the glaze, the muffins still have a touch of sweetness which contrasts very nicely with the tartness of the cranberries. And best of all, they are moist and tender, not tough like I feared a whole grain muffin might be. My third offering for the Chocolate Auction. I got this recipe from Nicole Weston’s excellent blog Baking Bites. She credits Everyday Food magazine with the original recipe. 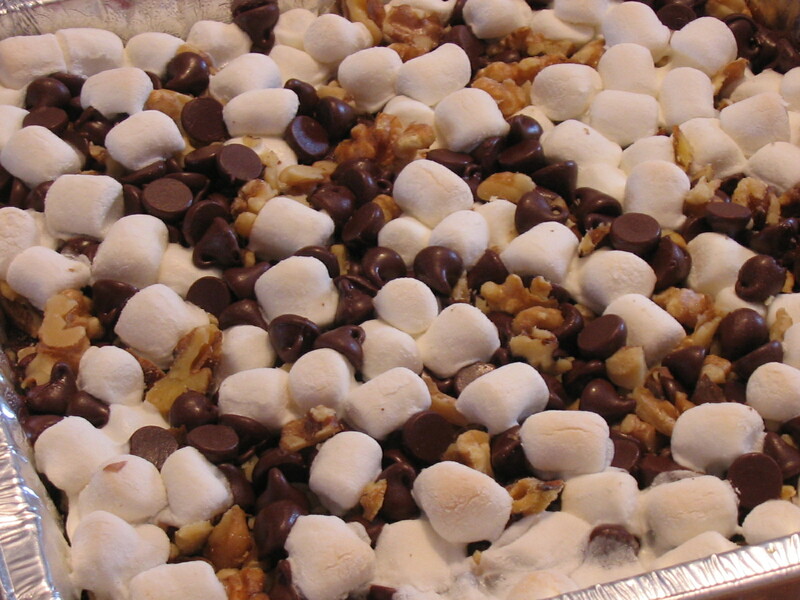 Beneath the layer of mini marshmallows, chocolate chips and walnuts is a thin layer of very moist and dense brownie. I debated about cutting the bars up because I thought it would’ve been nicer to see the bottom layer (which is not visible in the pan), but couldn’t figure out how to package it cut up. I am a big fan of dates. Apparently many people don’t care for them, but I find the inadulterated sugary sweetness of dates irresistable. 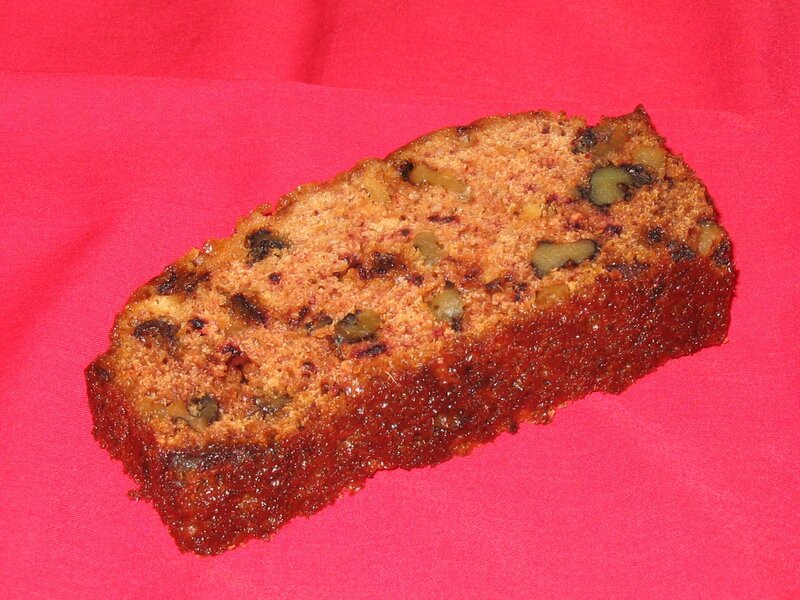 And I find date nut bread to be pretty foolproof. I got my recipe from P.’s Auntie Norma many years ago — I’d had tasted some she had made and I was hooked. I never really questioned why the dates are soaked in boiling water before they go into the batter, but was told recently that it was because the recipe dates back to the Depression and soaking the dates and then adding them to the batter, water and all, was a way to make the bread moist without the need for a lot of butter. Whatever the reason, I love date nut bread, particularly toasted and with a little schmear of cream cheese! I don’t know if this is true elsewhere in the country, but here in New England, come autumn you start to see fresh cranberries being advertised in the supermarket circulars. Once upon a time, some savvy cranberry marketing genius came up with the “buy two, freeze one” tagline, which was then placed on the cranberry packaging and in the supermarket ad copy. I am guessing that once the fresh cranberry supply runs out in the fall, that’s it for consumers who are looking for fresh or even frozen cranberries, or else why would we have to take it upon ourselves to preemptively scoop up the cranberries and hold them in our own home freezers? I generally ignore such mandates from food packaging and advertising but this year, crazy manic baker that I’ve become, I decided this buying and freezing idea might have some merit. And as I usually make a cranberry relish from scratch at Thanksgiving anyway, buying 2 bags (I even considering buying 3 or 4) seemed pretty reasonable. As it turns out, I didn’t end up making my usual cranberry relish this Thanksgiving, so I ended up with 2 bags of cranberries in my freezer at the end of November. My thoughts turned to coming up with something to make with all the cranberries I had now burning a hole in my freezer and despite being the mostly delighted new owner of a side-by-side refrigerator, I was ever mindful that freezer space is always at a premium. To my shock and surprise, I discovered that all those cranberry-themed recipes I had been imagining when I bought those fresh cranberries don’t actually require the use of fresh (or frozen) cranberries. The majority of the recipes called for dried cranberries, which are readily available year-round. Part two of my thought process was that I’ve been contemplating different quick bread recipes to bake and give as gifts. I’ve never been a big fan of cranberry breads, largely because all the cranberry bread I’ve ever consumed has been off supermarket bakery catering platters and they were disgustingly artificial tasting and memorable only in that regard. But with 2 bags of cranberries staring me in the face, I decided to have faith in my culinary abilities and give cranberry bread another try. 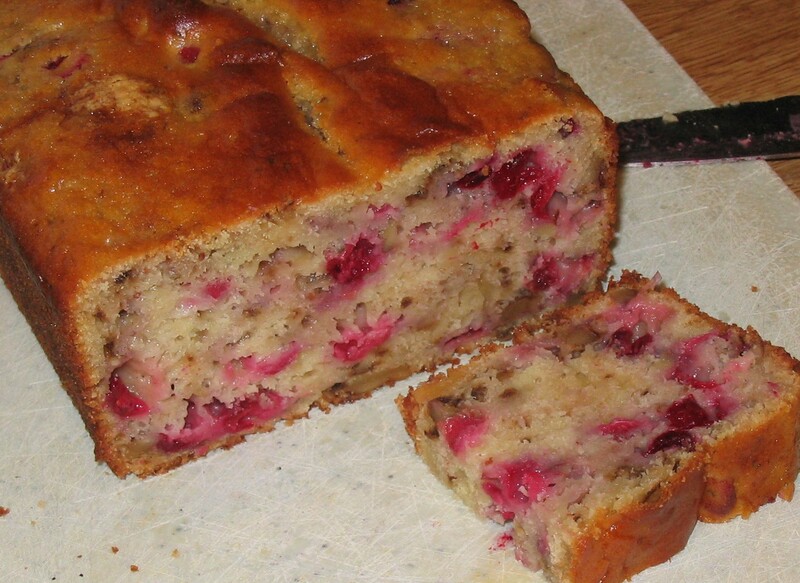 I found a recipe for Cranberry-Orange Nut Bread in my King Arthur Flour cookbook and decided to give it a whirl. The recipe calls for fresh, frozen or dried cranberries, orange juice and extract (or if you’d rather, orange zest and juice), walnuts and buttermilk (as luck would have it, I still had some buttermilk left from making cornbread for Thanksgiving stuffing — oh joy!). The finished bread was moist and subtly orangey — not overwhelmingly orange with that fakey taste so prominent in the supermarket cranberry breads. The chopped cranberry and walnut bits didn’t overwhelm, which pleased my chunk-phobic husband. The bread was very light on sweetness, something that might not be true if I had made it with the dried cranberries (which are sweetened). Not being a typical cranberry bread fan I’m not sure I’d put it on my must-bake list (date nut bread would come first, for starters), but aficionados of tart fruit and nut breads might really enjoy this one. 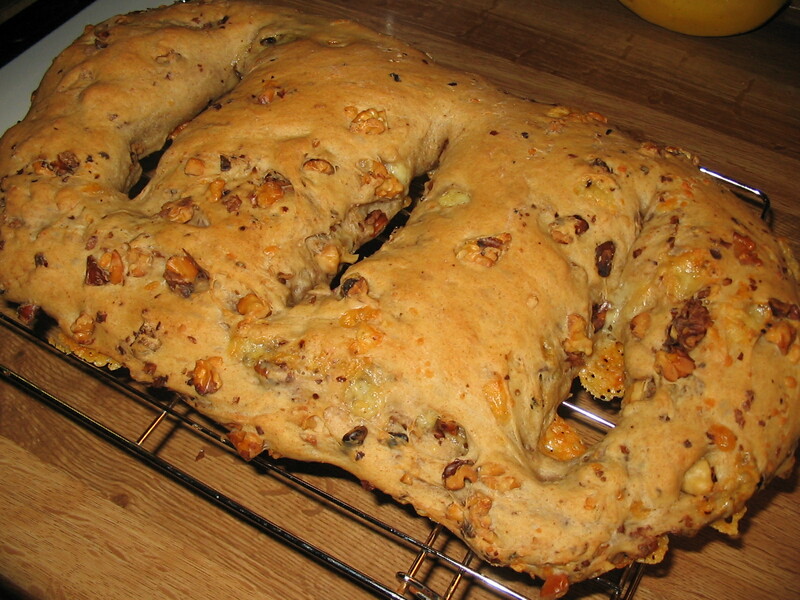 Fougasse is a Provençal bread, made from a pain ordinaire dough. In ancient Rome, panis focacius was a flat bread baked in the ashes of the hearth (focus in Latin). This became a diverse range of breads that include “focaccia” in Italian cuisine, “fugassa” in the Ligurian language, “pogača” in the Balkans, “fougasse” in Provence and “fouaisse” or “foisse” in Burgundy. The French versions are more likely to have additions in the form of olives, cheese, anchovies etc, which may be regarded as a primitive form of pizza without the tomato. Given that fougasse is a relative of Italian focaccia, I would have thought my dough would have been more wet and sticky. The recipe I had used both unbleached all-purpose flour and whole wheat flour so maybe that had something to do with the consistency of the dough. I was warned that mixing in the blue cheese and walnuts would be a messy endeavor, but I found it to be pretty straightforward.